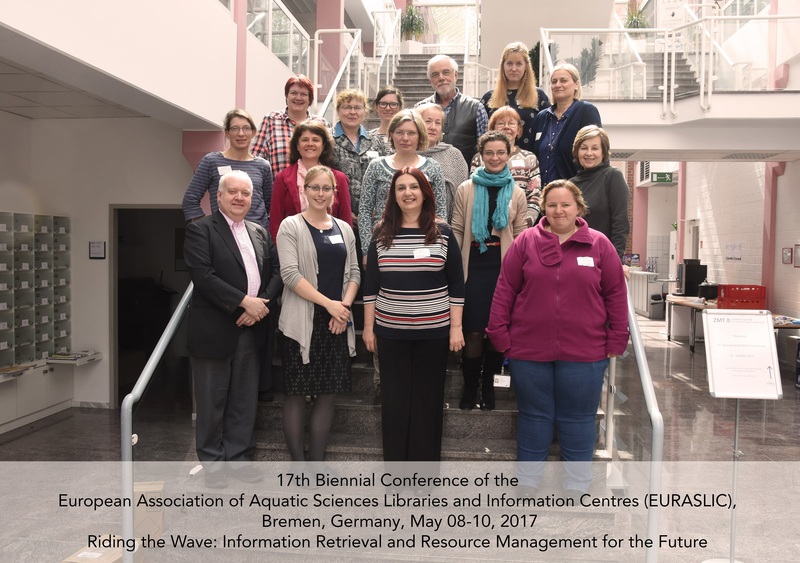 17th Biennial EURASLIC Meeting entitled Riding the Wave: Information Retrieval and Resource Management for the Future was held from 8-10 May, at Leibniz Centre for Tropical Marine Research, Bremen, Germany. At the participant's arrival the sun shined upon the town after a long time of cold weather, as we were told. Despite some obstacles that preceded the conference everything went smoothly according the plan. The evening before the conference participants met at the ice-breaking gathering on the top floor of the ZMT outbuilding. The results of election were announced during the conference, the old EURASLIC Executive Board was discharged and new one appointed. Bart Goossens is re-elected as EURASLIC President, while Christina Schrader became new Vice- President and as a Member representatives Olivia Diehr and Kateryna Kulakova were elected. Complete list of Executive Board is available at EURASLIC webpage. Peter Pissierssens, from IODE and Matthew Buys from ORCID kindly accepted invitation to give a presentation at EURASLIC meeting. Peter Pissierssens with the help of David Baca, that joined the session via Skype gave overview on IODE-IAMSLIC cooperation in which EURASLIC as sub-regional group is interested as well. Both parties expressed their interest in continuation of cooperation in forthcoming period. Main activities of IODE were shown with emphasis on their new policy that is directed towards sustainability. Also two participants joined the session via Skype (Marina Mayer and Snejina Bacheva). Matthew Buys gave overview of ORCID persistent digital identifier that is already adopted by many publishers, some CRIS systems and is interoperable with DOI and some other identifier schemes. The presenter hardly could finish his presentation because of too many questions. Two more presentations were of importance for possibility of active participation. Barbara Bultmann gave presentation on DIGIMAR project with overview on workshop held in Plymouth in April 2016. Also future plans on harvesting marine digital materials were mentioned. Kateyina Kulakova presented ASFA activities. As an advantage for members from developing countries that are ASFA partners is seen possibility to have paid membership by ASFA Trust Fund, or to receive funds for some project. Furthermore in what direction ASFA database should develop was discussed. The Conference encompassed variety of topics: from journals and publishing, open access research data management, research information technology,databases etc. Facing the increases in journal prices we've heard about evaluating schemes that enable libraries to retain at least the core journals. Although libraries and publishers are seen as enemies the example of good cooperation between librarian and institutional publisher was shown. During the times of uncertainty following the LOCKSS model (Lots of Copies Keep Stuff Safe) and putting papers in multiple repositories proved to be useful. We've heard of Open Access plan that enable researchers to publish more open access articles. Even though some repositories collect papers and other research data, they can be interoperable and crosslinked, easily retrievable through search engine. The new user interface created for 20th anniversary of Croatian Scientific Bibliography (CROSBI) was shown. And we were introduced with library cooperation project between Rostock-Gdynia-Riga and papers published thanks to that cooperation. There were two posters, one about information systems in Russia and other about books as art objects. During the conference several meetings (EURASLIC Board and Business meeting, ODIN ECET meetings) were held. Marina and Snejina joined us again via Skype for Board meeting, and Marina honored us by her virtual presence at round table that was held for the first time at EURASLIC conference. Under inovative conducting of Olivia Diehr at Alfred Wegener Institute for Polar and Marine Research, Bremerhaven round table give us opportunity to discuss and shape the future of EURASLIC. The emphasis was given to promotion of association in order to get more new members as well as to motivate the existing one to be more active. Also suggestions were made to introduce new possibilities for membership like professional exchange or at least possibility to exchange experiences, virtually via Skype, teleconferencing etc. As for mailing list it was recommended to use it not only for ILL requests but for discussion as well, which started right after the conference. And not to forget lovely dinner at Haus am Walde restaurant and city tour guided by very unconventional guide.